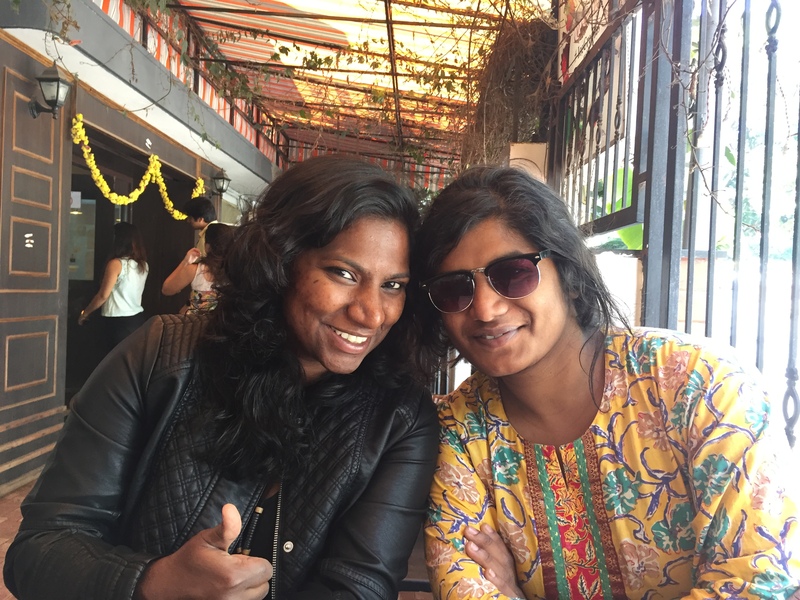 bangalore eats: breakfast at desserted. during my staycation weekend last month, sneha, shonali, and i checked out desserted for breakfast. right around the corner from shangri-la, desserted is a cafe and bakery that has become a popular hangout for students at the nearby mount carmel college. our visit coincided with the dusshera holidays, so we saw desserted on a fairly quiet saturday morning. located in a renovated home, desserted has a covered patio that is the perfect place to wile away a few saturday morning hours. inside are bakery cases so you can see what breads and desserts are on offer [all baked in-house], or you can peruse the extensive menus at the many tables on offer. breakfast delights at desserted. bangalore, india. october 2015.
we had a fairly eclectic breakfast between the three of us. 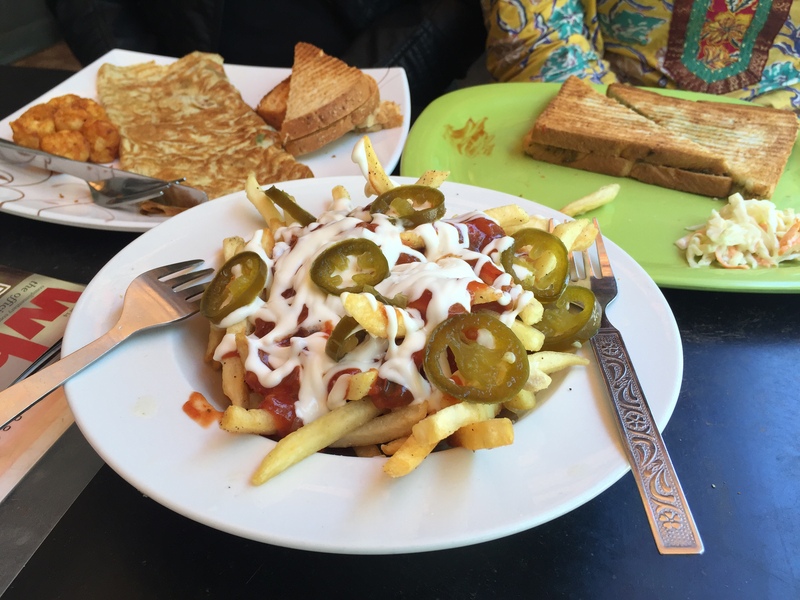 sneha had an eggs combo with fried eggs, shonu had a pesto and mushroom sandwich, and i thoroughly enjoyed a choco-chip waffle, and we shared a plate of “mexican” fries, which really just meant nachos with fries instead of tortilla chips. 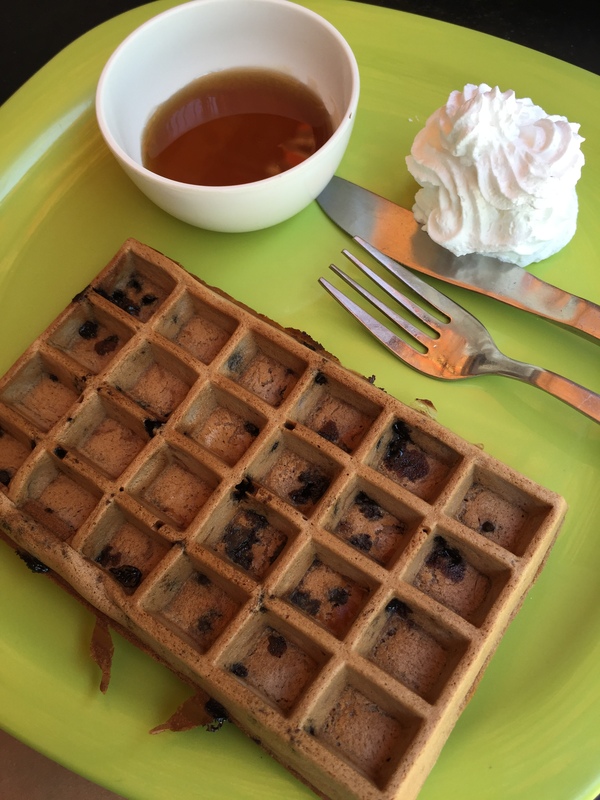 choco-chip waffle at desserted. bangalore, india. october 2015.
sneha and i had built up quite an appetite during our morning swim, and we polished off our food without any problems. it’s always nice to discover new breakfast options in the city, and desserted was a great find. location: no 42, 8th main road, vasanth nagar. bangalore – 560052.
landmark: next door to mount carmel institute of management. what we ordered: mexican fries to share; egg combo with fried eggs; pesto and mushroom sandwich; choco-chip waffle; coffee. our bill: somewhere around rs. 550 in total. fun facts: when sneha was studying at mounts, this building was a xerox shop! also, you are more likely to find it if you ask for “loafers lane”, as that is how everyone in the area refers to the street it is on. to keep in mind: there was only one lady serving all the tables when we visited — it was nice for a leisurely saturday morning, but i imagine it would be tough if you’re in any kind of hurry. will i go back? at some point, yes. it’s not in my usual area, but it’s worth a stop if i’m over there. what is your favourite breakfast spot? my packing list for sri lanka. sri lanka: expectations v experience.